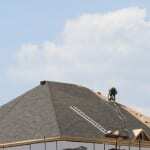 We will quickly and efficiently get your commercial roofing project completed. When you own a business or commercial property, it can be hard to find a company you trust for all of your commercial roofing needs. You want a company that is reliable, affordable, trustworthy, and insured. At Slippery Slope Roofing, we can take care of all of your commercial roofing needs and we can check all of the items you are looking for off of your list. At Slippery Slope Roofing, we know how important it is for you to get the job done quickly, so that you will not lose any business during the time your building is being worked on. This is why we only do one job at a time. We will complete your job from start to finish without starting another job, so you receive our undivided attention on your project. We are very reliable and will show up on time and ready to put in an honest day’s work. We also will clean our mess, so you won’t even be able to tell that we were there. We know how important it is for you to hire a company that is insured. This is important because it protects you and your business from any liability. You can have peace of mind knowing that if something were to happen, you would not be responsible for it. At Slippery Slope Roofing, we are fully insured with the WSIB, which allows us to provide reliable and affordable commercial roofing services. We are also accredited by the Better Business Bureau. If you are looking for commercial roofing services in the Midhurst, Ontario area, contact us today at Slippery Slope Roofing. We can handle jobs of all sizes and we will make sure we get the job done right.